Genuine Murata DK-120 Black Drum unit for the Muratec F 95/ 95e/ 98/ 100/ 120/ 150/ 160 fax machines. Genuine Murata TS-120 Black Toner Cartridge for the Muratec F 95/ 95e/ 98/ 100/ 120/ 150/ 160 fax machines. 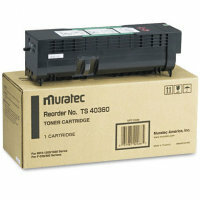 Genuine Muratec TS-41500E Black Toner Cartridge for the Muratec MFX1500 printer. Genuine Muratec DKT-112 Black Laser Fax Cartridge guaranteed to perform with the Murata / Muratec F112 Laser Fax Machines.